During our vacation to Boston and New York, one of the interesting, and challenging, aspects was navigating the subway system. We found the Boston subway system to be very similar to the Washington, DC system we had encountered a few years earlier. The NY subway, however, was a different cookie altogether. Or as one of our daughters described it, "The NY subway system is a whole box of crayons!" Image via WikipediaWhen one is a tourist in the city and riding on the subway, the great tendency is to be totally focused on the names of the stations ahead. Some stations are known to be well-lit and well-trafficked. These even have excellent musicians singing or playing their instruments as you walk along your way. Others, may not have enough traffic to offer the safety of numbers; these seem to just spell out "trouble". Twice in New York, we were approached by New Yorkers asking if they could help us find our way somewhere. One woman was so pleasant and friendly, I wanted her to go with us all day long! The Lord sent these kind souls to us to help us and encourage us along our trip. In life, we know there are many stations ahead. 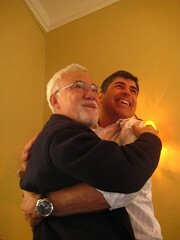 Some offer pleasant surprises and joyous moments. Others just spell trouble. There is always trouble ahead somewhere. But there is something, or rather Someone, out there too. At Trouble Station, God has been there before the first brick or train rail was lain in place. He is there in Trouble Station before our train even arrives, waiting to be our Help. We never have to walk through the subway station alone. How Much Greater. 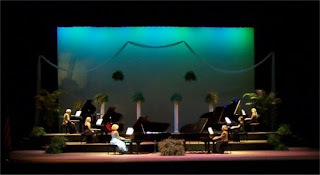 . .
Last night we attended the performance of the Mobile Piano Ensemble. 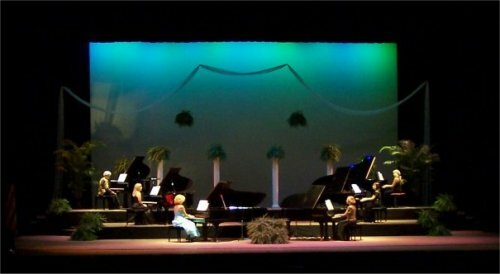 The stage was set with six grand pianos and at one time twelve pianists played together intricate and complicated pieces of music. As talented as the pianists were, however, their music was not that upon which I was mainly focusing. My eyes kept returning to a pianist who sat tall, with a commanding sense of presence. Although she wore a gold-sequined top, it wasn't her sparkling blouse which grabbed and maintained my attention. It was her white hair. The pianist had snow white hair cut in a short style similar to what my mother wore. Almost involuntarily, my eyes kept returning to that white head. My mother has been gone for thirteen years now, but the sight of someone who resembled her -- both in coiffure and stature -- captured my thoughts. At some point in the program, I began to surmise what would be my reaction if I could see my mother again at this very moment. My heart was immediately squeezed with both the grief and the delight those imaginations should evoke and tears welled up in my eyes. Then another thought came to me. If I had such a strong reaction to just imagining seeing my mother again, what will it be like when I see the Lord? How much greater will be my delight, my joy, my tears? How much more will my heart swell with the sheer knowledge of complete satisfaction and fulfillment? "That at the name of Jesus every knee should bow, of things in heaven, and things in earth, and things under the earth; And that every tongue should confess that Jesus Christ is Lord, to the glory of God the Father." The Unassuming Envelope. . . It was such an unassuming envelope, I almost tossed it aside to open it later. Then remembering I have friends soon to be married, I suspected it to be a shower invitation and opened the envelope. Image via WikipediaAlthough the name on the top of the card was clearly recognizable, it didn't dawn on me that I held in my hand a card from the former First Lady until I had almost finished reading the card. I suspected it to be a "form letter" type of card. Then I read the sentence that said, "Thank Noah for his service to our country." That could be no form letter. It was a real letter, written by a real woman, who was married to our 43rd President. 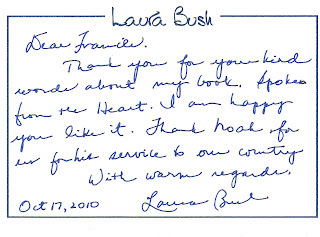 I had written Mrs. Bush after reading her book, "Spoken From the Heart." It was an incredible book which gave many insights not only into the Bushes themselves, but also into the events which transpired during President Bush's presidency. In my letter I spoke of our son's deployment with the Marine Corps and how her expression of their feelings during that time and their visitations to wounded and returning troops were a comfort to me. I never imagined receiving a response of any form, much less a personal letter. Mrs. Bush is a busy woman. She works toward promoting the freedom of Afghanistan women; she is active in the Alliance to Reform Education Initiative; she speaks at multiple venues supporting literacy programs and many more things which I couldn't begin to know. Yet she took the time to pick up a pen and write me. Me! 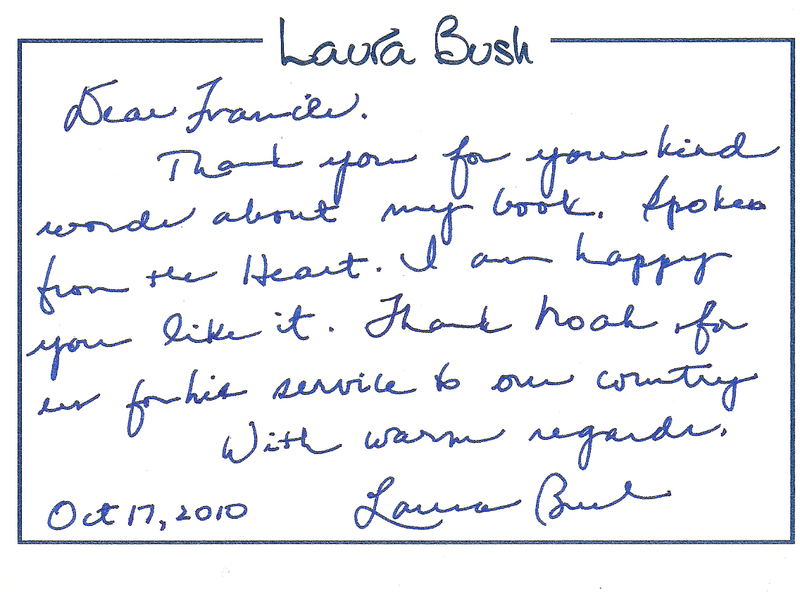 Needless to say, the card from Mrs. Bush will go in the same place where all my other treasured items are stored. But my very thoughts about this situation make me think of another valuable document, written by an even more important dignitary. I have a book written to me (Me!) by the same One who holds our very universe in place by the "power of His Word." I have a book more precious than all the volumes of all the books ever written throughout all the moments of history, because it was written for whom and by whom history revolves. It is well and good that we should have those that we admire, especially if they prove themselves to be men and women worthy of our admiration. Let us not ever forget, however, to look beyond those made of dust as are we, and look to the One True God. Let us hold most dear the One who. . .
"being in the form of God, thought it not robbery to be equal with God: But made himself of no reputation, and took upon him the form of a servant, and was made in the likeness of men: And being found in fashion as a man, he humbled himself, and became obedient unto death, even the death of the cross." UPDATE: I have been asked to put a scanned picture of the card on this post, and I am pleased to comply. I was just putting my things into my locker in the gym when a young girl, perhaps eleven or twelve, came running through the door past me to the restroom area. A few moments later, another girl of the same age came into the locker room crying. She sat at the end of the first bench and held her ankle. By that time her friend came around the corner with a folded pad of paper towels which she had soaked with cold water. I wasn't initially sure what the second girl's injury was, but I watched them closely. Her friend hovered over her, solicitous of anything she could do to relieve the other one's suffering. At one point she left the locker room in search of an ice pack. Still wearing my scrubs, I walked over to the injured girl, Lauren, and sat beside her. I asked her if she was ok. She sobbed out the story of her injury. Apparently the two girls were enrolled in the youth athletic program and the trainer had been playing a game of Dodge ball with them. The ball came in contact with her ankle, perhaps with a little more force than he had intended, and she fell down. I looked at her ankle, rotated it to determine if anything was broken, removed her shoe and her sock and decided that it was more her feelings which were wounded than her leg. A hug and some kind words went a long way to putting her on the road to recovery. Meanwhile her friend returned. I reminded Lauren that she had a very good friend to help her so much when she was hurting. The friend, whose name I never caught, told me, "I was sick a while back and Lauren took good care of me. My mother calls her 'The Nurse'." Only now beginning to change from my nursing scrubs to my gym clothes, I assured her there were few things better that she could be called. I was so impressed with the nameless girl who sought so diligently to be a friend when needed. More so, I was impressed that when I tried to compliment her on her behavior, she pointed it right back at her friend. Lauren, too, deserves my respect because it was her display of friendship and caring which had made such an impression upon her friend and even her friend's mother. I have often said the Lord has lessons for us from anyone, and today proved that to be true. Two young girls and their friendship and love were great teachers inside a locker room. "A man that hath friends must shew himself friendly." Alone In the Kitchen. . . 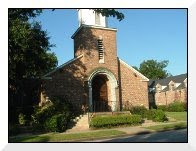 Yesterday I told you about Ms. Louise, how she served twenty-five years in her church's Nursery taking care of babies. Today I want to tell you something else about Ms. Louise. Ms. Louise is the perfect example of a servant heart. We were sitting in the fellowship hall of this church; members were coming and going, greeting each other and fulfilling their duties for the day as Ms. Louise was quietly cleaning up from an earlier breakfast. She cleared off the tables, she washed dishes, she put away supplies. I watched her, alone in the kitchen, working quietly. She didn't try to draw attention to herself, she didn't look for anyone to notice what she was doing. In fact, when I tried to thank her for the breakfast, she made a point of telling me that she didn't provide the breakfast, she was merely "cleaning up until it is time to go to the Nursery." She said it as if the cleaning up wasn't really her job or service to do, but something to do until it was time for the real love of her heart--taking care of those little babies. Ms. Louise could have chosen to sit in a chair, read a book -- read her Bible or chat with other members. Instead, she made the choice to work, to do something others probably wouldn't want to do. Let's face it, how many of us want to clean up a kitchen when we don't have to? Well, Ms. Louise does. She does it and she does it without needing anyone to ask her to or to thank her for doing it. Because she is doing it unto the Lord. A Job Well Done. . . 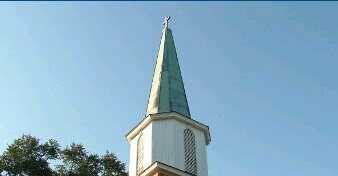 Yesterday my husband was the guest preacher at an area church. Between services, we sat in their beautiful fellowship hall meeting the sweet people of this church. One lady quietly worked in the background, clearing items from an men's breakfast. I went to thank her for a doughnut I had eaten, and she told me she didn't provide the breakfast, she was just clearing up until it was time to go to the Nursery. Ms. Louise said she had worked in the Nursery for twenty-five years. "Some of the babies I have taken care of are now bringing in their babies to me", she remarked. I told her that meant that she had done a good job if her "babies" were still coming to church and bringing their own babies back to her. It was a job well done! That's the text I sent to a dear friend who is currently going through an incredibly painful situation. I received the latest details of his circumstances during some drills for emergencies we were doing with our physicians where I work in Labor & Delivery, so my message needed to be quick and brief. As Christians we live and move as one glorious body, the Body of Christ. We may often feel alone, we may feel as if we are supporting the whole weight of the world upon our shoulders, we may feel as if there is no one else who has any idea of what we are going through, but that is not the truth. All Christians are connected in the great Body of Christ, and what affects one member, affects all. So when my friend, or your friend, goes through difficult painful times, we can be their support, their help, their comfort in a powerful way perhaps we can't even understand. The Scriptures tell us we can "bear ye one another's burdens," and through prayer and supplication we should do so. Never does our friend have to be alone. He has the Lord living inside him and he is a part of this wondrous and mysterious body with a bond that can never be broken. He always has somebody to lean on. UPDATE: Little did I know as I was writing this Powder Room, my husband, sitting beside me, was writing a "Special of the Day. . .from the Orange Moon Cafe" on the very same subject. Please read it, you will be blessed! 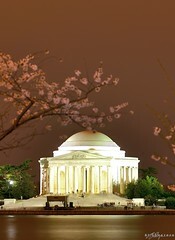 Several years ago we took a wonderful vacation to Washington, D.C. Touring our Image by Al Ebnereza via Flickrnation's capital was a great experience and even though we spent a week looking at monuments, historical documents and beautiful scenery, I wished we could have been there longer. Once we returned home, for some strange reason, for about two weeks I would awaken in the middle of the night with nightmares. When I would wake up, I would have the sensation that I was somewhere unfamiliar and I needed to find my way out. The only light in the dark bedroom was the sliver of light under the door. This small amount of light was all that was needed. It was enough for me to open the door, to be flooded with illumination from the light in the hall and to easily see the path before me. As my nightmares continued, I learned to find comfort in the small sliver of light. Often in our lives, we don't want the Lord to provide us with tiny slivers of light. We want the door illuminated with multiple bright floodlights, spotlights and even those tiny, sparkling Christmas lights. Once we reach the brightly lit door, we want the Lord to open it for us and push us through. But that isn't the way the Lord works. He shows us the small sliver of light under the door, and by faith we grasp the handle, turn the knob and walk through the threshold. The more we practice opening the door in the dark of night, the more comfort we find in the tiny slivers of light. that shineth more and more unto the perfect day." This afternoon I was sitting in the lobby of one of the buildings at work, looking at this wooden staircase. I have always loved this staircase. I love how it gracefully curves to the floor, I love how the steps are wider on the outside than the inside. I love the sheen and shine of the wood. I love to let my hand slide along the railing as I step down each stair every afternoon. While I was looking at this staircase today, though, I wasn't thinking about any of those things. I was thinking about myself. I was poring over my own feelings. . .feelings of being been taken for granted, being misunderstood and misused. It was while I was nursing my own personal injuries that the light from the window reflected off the wood of the staircase and caught my eye. In a moment, it was as if I could see everything that had gone on in the creating of the staircase. You see, the tree didn't grow in that shape. The tree had to be cut down and the timbers cut for those steps. 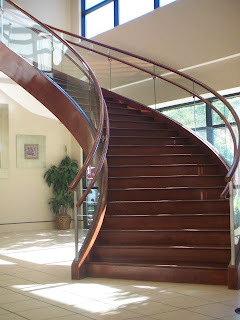 Each piece of wood had to be shaped to fit the curve of the staircase. They also had to be sanded smooth so no one would trip and fall as they traveled up or down. The wood didn't grown in that beautiful deep, rich color either. The stain had to be brushed on and then rubbed off. Finally, the wood had to be polished, rubbed and rubbed until a reflection was easily seen. The events that happened to me this afternoon were just part of the process of me going from a wild tree, to one day being a beautiful shining staircase. It is all part of removing a rough outer bark to reveal a reflection of glory and hopefully to provide a pathway for any who may need to see the way by what has happened in and through me. I have always loved that staircase. Now I will love it even more. for my unit in the hospital. Image by alwright1 via FlickrWhen I was notified that I had to come in to work, I was really upset. It wasn't about work, it was about football. 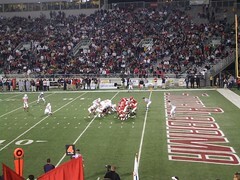 You see, since the beginning of the school's football program last year, I have been to every home game of the University of South Alabama. My plans for Saturday afternoon were to go to Ladd-Peebles stadium and enjoy the picture perfect weather and a great game, not to go to work. When I arrived at work I was in a foul mood. It was a good thing I was to relieve the scrub nurse. This meant I was to wash used surgical instruments, take them downstairs to Central Sterile Processing, set up and check the conditions of the operating rooms. This was a good assignment for me because my attitude was so bad, I wasn't good for human interaction. I went about my work with the instruments and then checking the operating rooms in relative silence. I wasn't exactly pouting, but I wasn't happy to be there either. Then I was ready to take the instruments downstairs to Central Sterile. Central Sterile is about as far away from my unit as possible, so it was a good walk, pushing my cart. When I reached the door, I had to ring the door bell and wait for them to answer. I went inside and the lady working inside greeted me with the biggest and most beautiful smile I could imagine. She was very helpful giving me exactly what I needed and we chatted about something I can't even remember now, but I know that when I walked out that door, I was in a much better mood. I was still at work, I was still missing the football game and the wonderful weather. But I had been touched by something better than football, better than a cool fall afternoon, something intangible. This woman's love, her joy, her helpfulness had showered out of herself onto me and changed my night. I would not be surprised to find out she knows the Lord and was certainly walking in the Spirit that afternoon. I think what showered out of her onto me was the Lord. Then the Lord did what the Lord does, He redeemed and He restored.